The Wheat Marketing Center (WMC), located in the historic Albers Mill Building in Portland, OR, acts as a bridge between wheat growers and customers. WMC is a technical crossroads of the wheat world linking wheat producers, consumers, millers and end product manufacturers. WMC provides: technical training for customers on improving end product quality, grower workshops focused on the importance of wheat quality, innovative research, product development, and crop quality testing services. Consumer tastes are evolving in domestic and international markets; WMC’s programs demonstrate how U.S. wheat can be used to meet changing consumer demand with products that are nutritious and cost competitive. WMC focuses on promoting U.S. wheat by demonstrating its quality and functionality in end products, including Asian noodles, crackers and biscuits, tortillas and flatbread, and many other baked goods. Pilot scale production lines, state-of-the-art quality testing equipment, and internationally recognized technical expertise provide great value to our state wheat commission partners, wheat industry stakeholders, consumers, and milling and food manufacturers around the world. 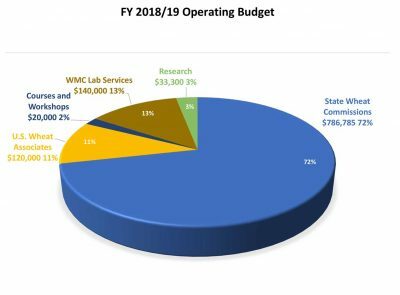 The Wheat Marketing Center receives the majority of its funding from state wheat commissions from Idaho, Oregon, Washington, Colorado, Montana, Nebraska, North Dakota, and Oklahoma. Each year, these states may allocate funding for general operations, special projects, and new equipment. Other operating income is generated by technical course fees, research projects, and lab testing services. During the 1980’s, wheat producers sending their wheat to export market through PNW ports dreamed of creating a research and technical center to increase understanding and knowledge about the quality and value of U.S. wheat. Thanks to the leadership of U.S. Senator Mark Hatfield of Oregon, Congress allocated $6 million to make the dream a reality. The Albers Mill Building, a former flour and feed mill built in the early twentieth century on the banks of the Willamette River, was extensively renovated to house the new center. The building is listed on the National Register of Historic Places and is designated a Portland Landmark. Other wheat-related entities including U.S. 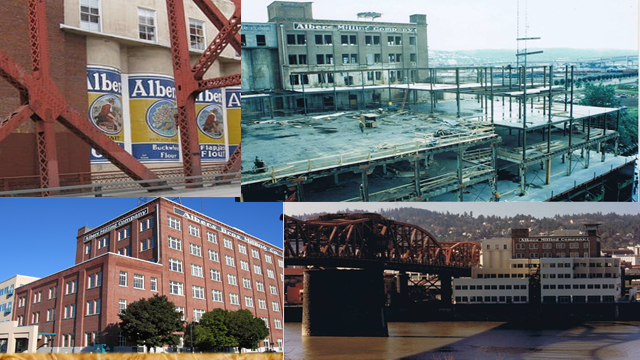 Wheat Associates, the Oregon Wheat Commission, and the U.S. Federal Grain Inspection Service (FGIS) have offices in the Albers Mill Building. This co-location facilitates the frequent cooperation among the different groups. The building is jointly owned by the Wheat Marketing Center and commercial real estate developer Bill Naito Co. Seven state wheat commissions (Idaho, Oregon, Washington, Colorado, Montana, Nebraska, and North Dakota) and the Port of Portland were WMC’s charter entities; Oregon State University administered the federal grant that helped fund the project. In the summer of 1988, the newly-formed Wheat Marketing Center hosted a workshop attended by 50 participants, including wheat commission members and staff, customers from Japan, Korea and Taiwan, government officials, and other representatives from the wheat industry. This workshop helped design WMC’s programs and priorities. Since that seminal event, WMC has hosted hundreds of courses and workshops for wheat producers from across the country and wheat stakeholders from around the world. Last year alone, over 500 people from 20 countries visited WMC. The flags on the walls of our innovation lab underscore the breadth of WMC’s reach. The renovated building and the Wheat Marketing Center were formally opened in October 1989. Key to the new center’s educational mandate were educational displays telling the story of how wheat moves from field to international markets. They included wheat silos with the six classes of wheat, maps of wheat production and transportation methods, and two multimedia areas detailing the importance of wheat foods in Japan and Korea. These displays have helped educate thousands of visitors over the close to thirty years of existence; new displays unveiled in October 2017 incorporated updated information and technology to continue telling the wheat story. WMC has remained focused on its core mission of improving the understanding of how U.S. wheat can meet the changing demands of global consumers. The original seven charter states and the Port of Portland remain engaged and are joined on the board by five other industry representatives. Oklahoma joined the WMC Board in 2018. New training programs, state-of-the-art equipment, and innovative research topics are being utilized to meet the ever-evolving challenges facing the wheat industry. With the addition of new educational displays and an updated website, we are ready to address the challenges of the next thirty years.